He is in Spain completing his masters in business administration. Having his masters in engineering degree already he had a desire to do his MBA in one of the top ranking business school in Europe and is pursuing it. And we are all very proud of him.. he loves to explore and learn and keeps everyone happy in and around him. I have a darling sister-in-law, who is as sweet as him. 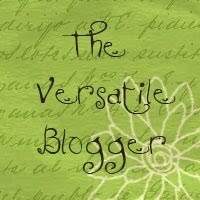 Its nostalgic ……My dad had an opportunity to work in different states when we were growing. Being a girl, I was much protected and taken everywhere, my parents moved, while my brother was living at my aunt’s place until he completed his high school. So, I did not get to spend much of my childhood days with him. That might be the reason, I never got to fight with him when we were together during holidays. I was the naughty one and got yelled by my parents every single time something went wrong! and he was a polite, decent and well-behaved child in my family. Time moves by so fast, now we have our own lives and families but one thing is for sure, no matter where we are or how far we live, I love him and respect him for what he is! Though I cannot share my cake with him, I share it with my family thinking about all the happy times we have spent together! CHEERS…. Preheat the oven to 350 degree F. Grease two 8 inch pan with baking spray or butter. While the eggs are still cold, separate the white and yolks and place them in separate bowls. allow them to come to room temperature. In another bowl, mix flour, baking powder and salt. 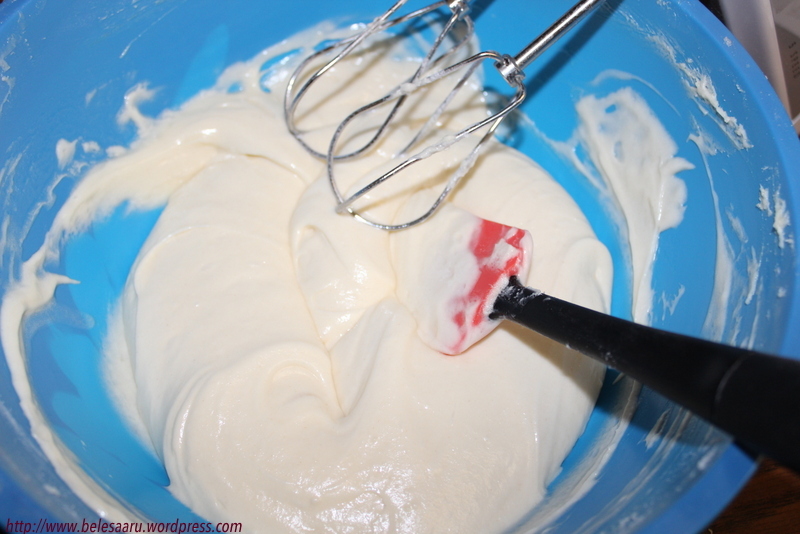 In an electric mixer or hand mixer beat butter until soft, add 3/4 of the sugar and beat until light and fluffy. Add in the egg yolk, scrape down the sides and beat well. Add vanilla extract and mix until well combined. Now alternating with flour and milk, mix them with low-speed. Beginning and ending with flour. In another clean bowl, beat the egg white until foamy, add cream of tartar and mix until soft peaks appear. Add the remaining 1/4th of sugar and continue to beat until stiff peaks forms. Now with a spatula slowly take little of this mixture and fold it with flour mixture. Then mix the remaining of this mixture with the flour mixture until just combined. Do not over mix and deflate the batter. Pour equal amount of batter into the 8 inch pan and bake for 20-25 minutes or until a tooth pick inserted in the center comes out clean. Cream the butter and cheese together and until nice and smooth. Add the confectionary sugar one cup at a time. Scrape down the sides of the bowl. Add the zest and vanilla extract and beat on high-speed until the frosting becomes light and fluffy. I did not assemble my cakes, instead I made two separate cakes spreading the frosting completely over the cake. If you wish to assemble the cake, place one of the cake layer, top facing down. Spread 1/4 cup of your favorite fruit sauce or jam. Now spread 3/4 cup of the frosting on top of the jam/sauce and place the next cake layer, top of the cake facing down onto the filling. 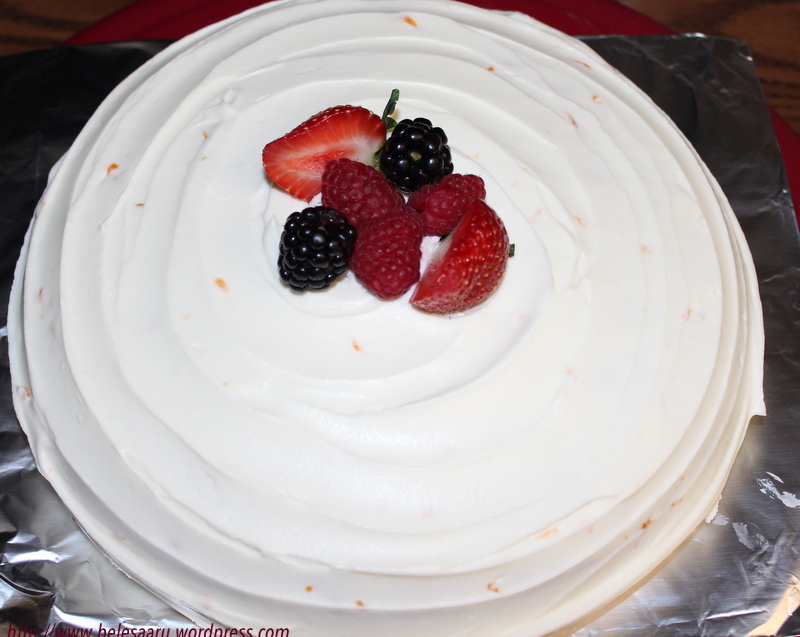 Spread the remaining frosting on top and sides of the cake and refrigerate until its time to serve. Decorate with colorful berries or just serve it plain! Purdy, Susan G. ‘A Piece of Cake‘. Collier Books. New York: 1989. What a great cake for someone special! Thanks a lot Nora! It is indeed for someone special.. Yuuum!! Looks great, your lucky brother! happy birthday to your brother!!! Thanks Juliana! 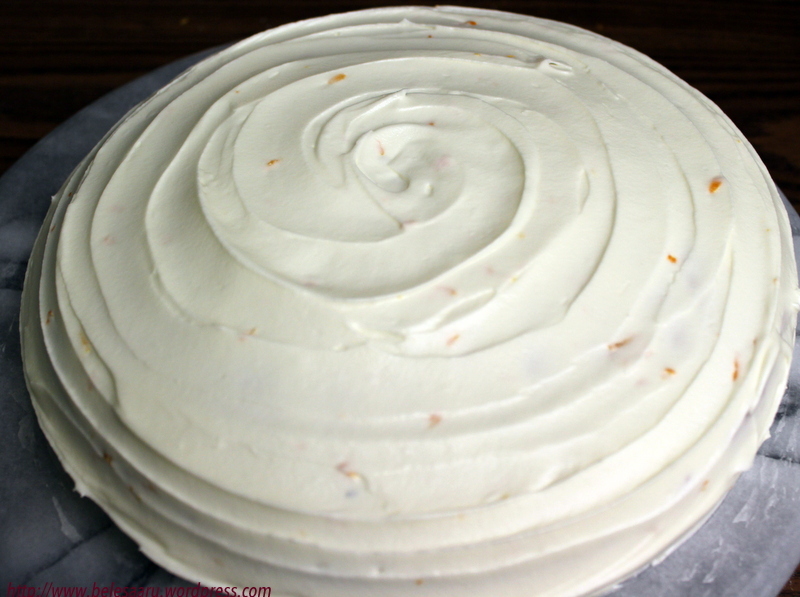 this is one wonderful cake I love to bake often… the cake comes out very soft and fluffy…. The cake looks perfect for celebration and your brother is lucky to have a lovely sister like you. Belated birthday greetings to him. I love the contrast in colors! White of the cake and red of the berries! Beautiful! Thank you so much Katerina! 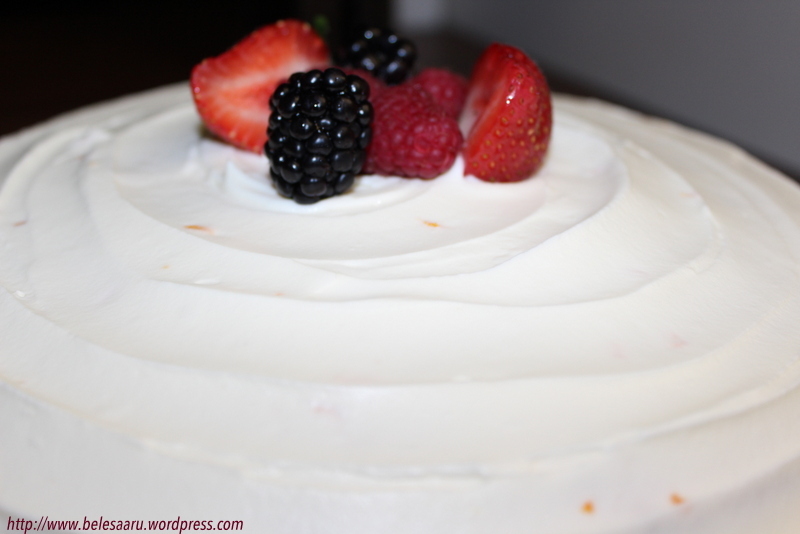 Gorgeous cake – love the lemon/orange zest in it – I can imagine it adds taste too! Thanks Shashi! It does add a great flavor to the frosting.. 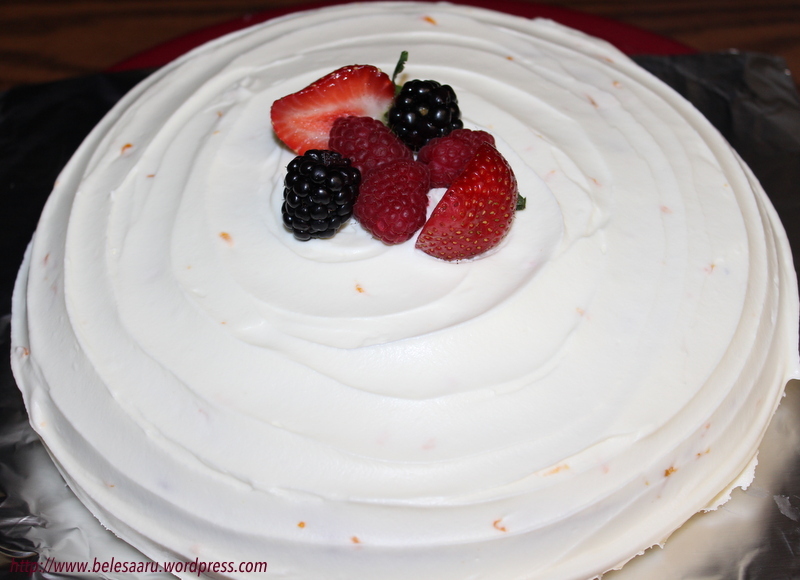 I always love to add a hint of this zest in my frosting.. it brings out a wonderful taste! What a delicious way to celebrate your dear brother’s birthday! Happy birthday to our loved ones! Cake is how you show love, for sure!!! So frosted and creamy perfection! Beautiful white butter cake, Can you give me a slice. What a sweet post and equally lovely cake! My favourite part is the frosting..it is so creamy! Thanks Sonali! living far away from him, this is the least I could do to celebrate his birthday. Dear Deepti, what a very pretty cake – I love white cakes and this White Butter Cake looks so elegant and just perfect for a birthday celebration – how sweet of you to bake this for your brother! And the added fruit add such a nice touch too! Happy Birthday to your brother! I am sure if he was here, he would really enjoy it! Looks fabulous. Birthday wishes to your brother… cake looks yummy! !